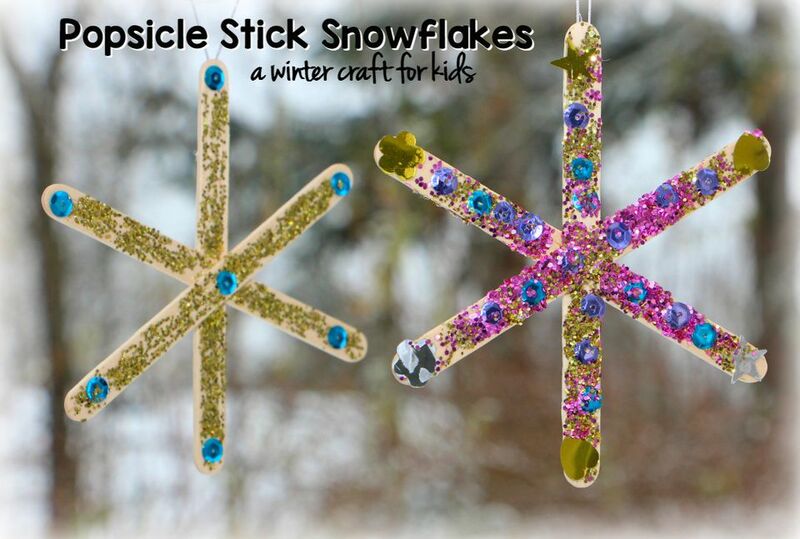 Snowflake crafts are a classic activity to do with kids in the winter months. They can add color and cheer to your windows or home during the dark months of winter. Plus kids love the idea of snow so making snowflakes is always fun for them and these ones won't melt like the real ones! It's great making simple crafts at home and these easy and glittery popsicle snowflakes only need a few supplies, which you may already have in your classroom or home craft storage. They are a quick and easy craft that is surprisingly easy to clean up and the finished product looks fabulous when it is done! Create your own winter wonderland with this glittery snowflake craft today! This simple craft only needs a few basic supplies. Here is the list of what you will need to gather to make this snowflake craft. To turn your popsicle sticks into a snowflake you need a few popsicle sticks and some glue. You'll use between three and four sticks depending on how you want your end product to look. In the center of the popsicle stick drop a dab of glue and then layer the sticks on top of each other, creating a snowflake shape. This is great fine motor work for preschoolers! The next step is adding the glitter! Spread glue onto each of the popsicle sticks. Sprinkle glitter over the wet glue in whatever colors you want. When you are done shake off the excess glitter and set aside to dry. Put an extra sheet of paper under the glitter projects so you can fold up and throw away when you are done, making clean up much easier. On the back of your glitter snowflakes glue a piece of string so that you can hang them, or in a loop so that to use them as ornaments on a Christmas tree, but they make great decorations for winter time too. No matter where you hang them, these snowflakes are eye-catching.